Holland House Cooking Wine is wine MADE for cooking. Holland House uses premium quality wine stock and has a perfectly balanced taste and aroma. The salt that is added makes it stable in your pantry. This gives you a consistency of flavor you can depend on from the first time you open it to the last drop. Cooking wine is used as an ingredient; it is not meant to be consumed as a beverage. Its very convenient to use because it doesn’t require refrigeration after opening, so you can just store it in your kitchen cabinet. You can find lots of great recipes using Holland House® Cooking Wines or Premium Vinegars on the Mizkan web site. 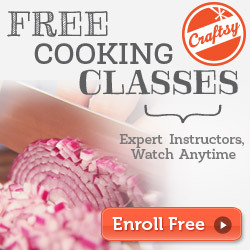 Explore to find Quick & Easy ways to make flavor come alive! 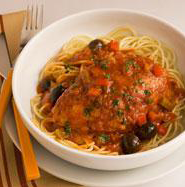 Check out the yummy Chicken Cacciatore recipe below. This is a robust, quick-to-make combination of chicken, onions and bell peppers in a wine-sparkled spaghetti sauce. If you prefer, use skinned chicken breasts to eliminate excess calories. In medium skillet, heat oil over medium-high heat. Add chicken; sprinkle with pepper. Cook until chicken is light brown, about 2 minutes on each side. Add onion and peppers; cook 1 to 2 minutes. Stir in spaghetti sauce, cooking wine and olives. Bring to a boil; reduce heat. Simmer until chicken is tender and no longer pink, about 10 to 15 minutes. Serve over cooked spaghetti. Reader Giveaway: One lucky Thrifty Recipes reader will win two bottles of Holland House Cooking Wine. To enter, simply fill out the form below by 12/21/11. I like to use wine in my cooking. ladyvon at grm dot net.